Despite CAT5e being far superior, standard CAT5 twisted pair cable can still be sufficient for many common applications. In fact, there are still companies operating today that have special requirements for CAT5. These will be the exceptions of course, because almost all new installations are being done with CAT5e instead. The improved signal carrying capacity of CAT5e is the primary reason for this. CAT5e also has improved durability due to improvements in the quality and thickness of the PVC protective jacket. It is more than suitable for most data cabling requirements. Network support - CAT5 twisted pair cable will support 10/100 Ethernet. That is, Ethernet and Fast Ethernet. CAT5e twisted pair cable will support Ethernet, Fast Ethernet, and Gigabit Ethernet. 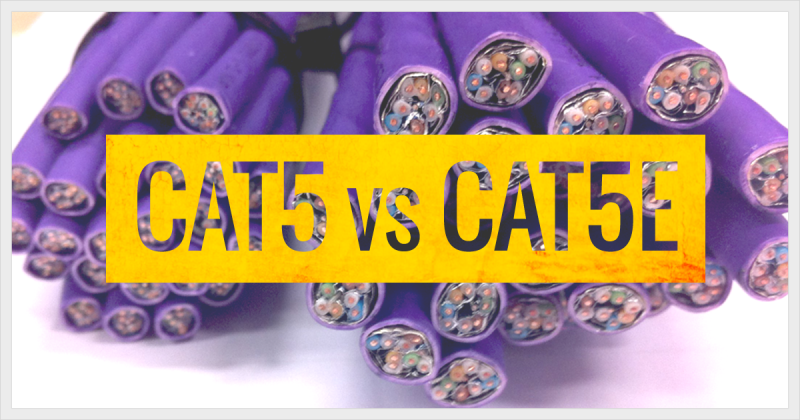 CAT5e is completely backwards compatible and can be used in any application in which you would normally use CAT5. Cross talk - Cross talk is the electrical interference that results when one wires signal effects another wires signal. CAT5e twisted pair cable has been improved over CAT5 in this respect and so cross talk has been greatly reduced. Bandwidth - This is directly related to network support, in the sense that the bandwidth is the information carrying capacity of a system. The greater the bandwidth, the greater the information carrying capacity in a given period of time. CAT5e twisted pair cable is rated at 350 megahertz and it is this increased bandwidth compared to CAT5 cable that allows it to support Gigabit Ethernet.